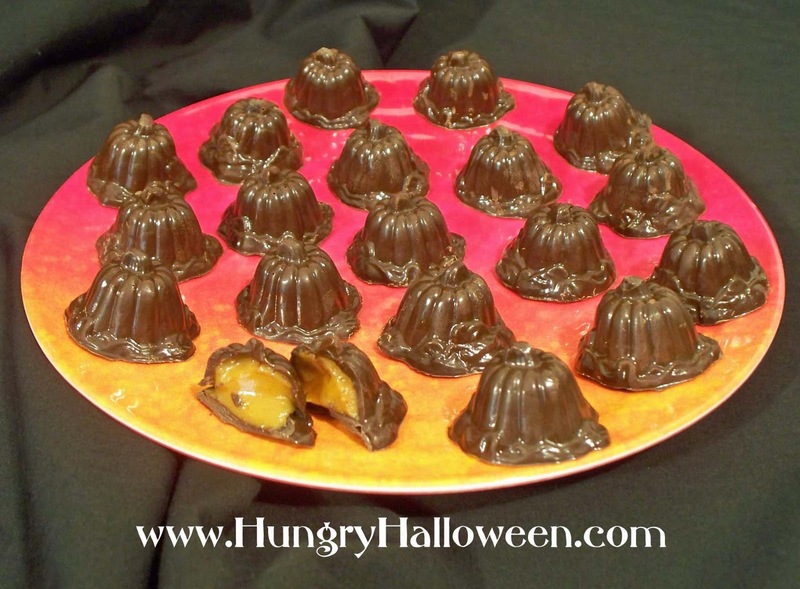 Click here to see the recipe to make these Pumpkin Truffles. I love Halloween and it was a "treat" finding this site. I have bookmarked it. I have a site about having a dinosaur halloween for little ones so I have been doing some searches on the subject. I like your handburgers!! I am a gfc follower. I am going to try these truffles, they look really good. My favorite use for pumpkins is in a pumpkin cookie recipe that I found. It is from boston, and is over a hundred years old. I have never had a cookie that tastes anything like it. Love this book. Anyone who loves Halloween will. Great ideas. The truffles look amazing. The step by step photo log is wonderful! Hi dmr301, I am so happy to hear you love the book. I'd be thrilled if you wrote a review for the book and posted it on Amazon.com. Oh, I love pumpkin cookies and have been searching for the perfect recipe. Would you be willing to share the recipe with me? I'd love to try them out. My favorite use for a pumpkin is to carve it. I have made some really cool ones in the past. I love the looks on my kids faces when one turns out spectacular. As far as eating pumpkins it would be pumkin bread or pie. Both are delicious. The book looks fantastic. I love making Halloween goodies. I love using pumpkins as a centerpiece to hold flowers and then I like using the plup in a soup. I'm a hungry halloween blog follower and my favorite thing to do with a pumpkin is to carve it and toast the seeds. My favorite use of a pumkin is to play a fortune telling game with it at our yearly Halloween party. I carve slots into the pumpkin and place fortunes inside of the pumpkin and have a tiny bit of the fortune hanging out a slot. The guests take turns pulling their fortunes from the slots cut into the pumpkin. Am public Google follower of this blog. Firstly I want to thank you for the great instructions for tempering chocolate. They are the first I have found that really explains it and gives instructions that are easy to follow. As for Halloween who doesn't like the opportunity to become someone else, maybe a dream person. Such fun. Only problem is that I usually end up eating too much treats but what the hey it is only once a year. Hee! Hee! My favorite use for a pumpkin is for general fall decor. I'm a new follower and I love a good pumpkin spice shake! omg love halloween sooo much! so glad i found this site! now a follower also i love using the pumpkin for carving & also pie! My favorite pumpkin recipe is for a curried pumpkin soup. Delicious! (I am a follower). I tagged your book as cookbook (#47). Oh my gosh those truffles look amazing. That might be my new favorite thing to do with pumpkin. My current favorite is to make pumpkin bread pudding. I love the pumpkin seeds roasted in the oven, and of course, pumpkin pie. I added "halloween recipes" to the tags on Amazon with 2! last entry :) good luck everyone! Oh, I so want to try these pumpkin truffles, Beth. Delicious and different! Thank you for sharing! I follow you on GFC. My favorite use for pumpkin is to give them to my mom-she makes the worlds greatest spicy pumpkin pie! GFC follower kycouple2000. My most likely use for a pumpkin would be decoration (sorry). Love all your ideas. You are such a talent, Beth. Posted on Facebook too! And will also post on my blog later today with the Amazon link to the book. I love to use pumpkin for pie! I'm a follower. I like to make pumpkin bread, pumpkin pie, and pumpkin muffins. My favorite use of a pumpkin is to decorate for fall with. But I also use the inside to make pumpkin pies and muffins. I am a follower. We like to use the pumpkin for decoration, but , the insides of it for homemade pie! My favorite use for a pumpkin is pumpkin pie! I now follow you via google. I love your site and I will refer friend, but on esuggestion...I understand why you used black for the background but I found it difficult to read. I use pumpkins for decorations, pies and muffins. I follow and love your site. I love Halloween. I am not sure if my last post worked. I use pumpkins for decorations, pies and muffins. Favorite use for a pumpkin?! That is an extremely difficult question.. I use pumpkins for jack-o-lanterns. I became a follower. After decorating pumpkins, I love roasting the seeds and making pumpkin loaves with a cream cheese filling. Tagged your book on Amazon: "cookbook(50)"
I'm now a subscriber. I love your website. I have a kids halloween party and I love your ideas. They'll look great on my goodies table. oops I forgot to answer the qustion. I'm a blog follower now. I love your website so many wonderful ideas. I love to carve a Jack o Lantern out of a pumpkin. Its so much fun to do it with the kids. We scrape out the insides and roast the seeds while daddy finishes the carving. love pumpkin in pumpkin bread! My favorite use for the pumpkins, are to let the kids draw, or carve them however they like, because I take the seeds out, well they do, we place them on paper towels let them dry, put them in a zipper bag, and plant them for the following yr. So they plant them, tend and water them, harvest them, carve them, and the process starts right back over. They love showing their friends what "they" did. I follow via GFC. I love using pumpkin to make pumpkin pie. Not very original but it's one reason I look forward to Thanksgiving. I follow and I love toasting the seeds! Follower, I love Halloween, its so much fun, thanks! GFC follower and I love Pumpkin Cheesecake. My favorite use for pumpkins besides jack o lanterns is to make pumpkin pies. I love pumpkin cookies that my neighbor makes. I need to get that recipe. I also love pumpkin bread and pumpkin seeds. Jack - o - lanterns are my favorite use! I tagged, it is 51. GFC follower and we mostly use pumpkins for decorations in the fall. I follow now as /\Heather/\ . Is there actual pumpkin in a pumpkin spice latte? Hmmmm? I am a follower through GFC. My fave use of pumpkin is in pumpkin pie. It's so delicious!!!!! I love making soup and pies. I also love roasting the seeds. I'm curious - where did you buy your chocolate mold? I've never seen one exactly like it. Very nice! I'm curious, where did you get the pumpkin chocolate mold? I've never seen one quite like it and love the shape.